Mubashar Ahmed Majeed is the Chief Executive Officer of Rousch (Pakistan) Power Limited since May 2013. He Joined Rousch (Pakistan) Power Limited in 2010 as a Chief Technical Officer and had a leading role in LTMSA and O&M Agreement’s negotiation. He was appointed as Chief Executive Officer by the company’s Board in May 2013. Mr. Majeed started his career in 1987 with WAPDA and served at Pakistan’s largest CCGT plant initially with WAPDA and later with KAPCO till 1997. 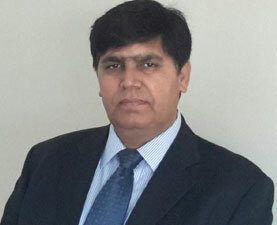 He worked from 1997 till 2001 at Rousch Plant with ESBI International and was part of commissioning and O&M team. From 2001 till 2010 he worked with AES Inc. His first assignment in Qatar was for development, construction and O&M of country’s first ever IPP of 820 MW combined cycle plant and desalination plant of 40 million gallons per day capacity. Later, he worked in Jordan with AES as Project Director from 2006 till 2010 on development and construction of a Greenfield 370 MW CCGT plant which was the first IPP in the Hashemite Kingdom of Jordan. Mr. Majeed is a Mechanical Engineer by profession. He graduated from University of Engineering & Technology Lahore in 1986. Mr. Majeed has rich experience of over twenty five years in Power sector in Pakistan and overseas in progressing and diverse roles from O&M, business development, construction, contract negotiation and management.